South Africa’s Chad le Clos stunned 200 metres butterfly king Michael Phelps in London on Tuesday night, snatching gold to end the American legend’s attempt to win a third successive Olympic title in his signature event.Phelps, the most successful Olympian in history, with 15 gold medals and 19 medals in total after the evening’s programme (he later won gold in the 4 by 200m freestyle relay), had won every Olympic Games and World Championships 200 metres butterfly title for over a decade. 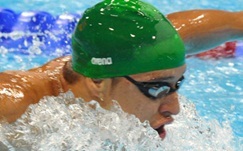 Le Clos was the second fastest qualifier for the final after setting an African record of 1:54.34 in the semi-finals. Japan’s Takeshi Matsuda, a bronze medal winner in the 200m butterfly in Beijing four years earlier, was fastest in 1:54.25. Phelps, meanwhile, won his semi-final in 1:54.53. In the final, those three men, swimming in the lanes three, four, and five battled it out for the title. Phelps took it out fast over the first 50 metres and led Le Clos by 0.09 seconds as they turned. At 100 metres, he had extended his advantage to 0.27 seconds. With 50 metres to go, at the last turn, Le Clos had slipped to third behind Phelps and Matsuda, 0.58 seconds behind the American. The chasing pair fought back hard, however, and in the last 25 metres Le Clos and Matsuda closed on the great American with a furious finish. Phelps came up just short of the wall with his stroke and Le Clos burst past to out-touch him in 1:52.96 to shatter his previous best time, which he had set in the semi-finals. Phelps finished in 1:53.01 and Matsuda in 1:53.21. Anxiously looking towards the scoreboard afterwards, Le Clos saw the amazing result and joyously smashed the water with his fist before letting out a loud yell of triumph. He pointed towards the crowd to acknowledge his mother and father and the South African support. Then it seemed to hit him as the scale of his achievement began to make sense. Le Clos shook his head in wide-eyed disbelief, holding his head in his hands for a moment. Tears welled in his eyes. For the 20-year-old South African, a dream had come true and he had beaten his hero. Le Clos had entered the Olympics, acknowledging that Rio 2016 would probably be where he would be able to best challenge for Olympic medals. Suddenly, he had beaten the most successful Olympian of all time in that man’s strongest event! “It’s a dream come true. Michael Phelps is an idol to me and he still is,” Le Clos said after the race. Later, standing on top of the Olympic podium, gold medal around his neck, Le Clos struggled to sing the national anthem as tears filled his eyes. No worry, he had plenty of South African supporters singing it full of gusto as they celebrated his superb victory. Once the music stopped, Le Clos’ face broke into a wide grin. His father, with a South African flag draped around his head, used it to dab away tears, his mother mouthed: “I love you.” And South Africa celebrated another wonderful victory in the swimming pool at the 2012 London Olympic Games.